With damage done from constant criticism of the performance of its wireless network, as well as a public ad war with rival Verizon, AT&T, the exclusive carrier of Apple's iPhone in the U.S., has begun an attempt to rebrand itself as a "lifestyle company." The new advertisements featuring the slogan "Rethink Possible" began airing Thursday during the Masters golf tournament. The new brand is being introduced through five new TV spots, and will apply to a broad range of AT&T products and services. "AT&T is launching a new brand promise, 'Rethink Possible, 'that articulates what AT&T is today: An innovation company," the company said in a statement. "Rethink Possible will highlight how AT&T is delivering meaningful innovation thats changing how people live, work and play. It conveys our desire to push the limits of whats possible to make life better for our customers. We rethink possible so our customers can rethink possible." One commercial begins with a man being introduced in the future as the 57th president of the United States as his parents watch and smile. It then rewinds to a much earlier point in his life where the man's parents first met, when his father changed a train ticket on his smartphone. It ends with the line "Any second could be the second," before showing the new logo and slogan. It also, in a voiceover, touts that AT&T has the nation's fastest 3G network. Profiling AT&T's "ambitious" effort to rebrand its image Advertising Age this week gave details on the new advertising campaign, created by Omnicom Group's BBDO. The effort will go beyond TV to include print, outdoor, digital, in-store, and "non-advertising marketing." The report also noted that services from AT&T such as rollover minutes lack mention in the commercials "if they don't fit under the new framework." 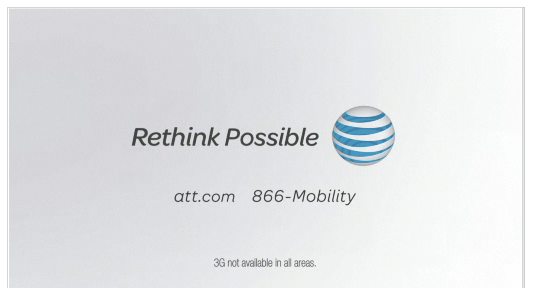 The rebranding also includes a new logo with the AT&T globe that removes the name of the company from the graphic design. It's all part of an effort, the report said, to make consumers think of AT&T as more than a telecommunications company, but an "innovation company." A new video on the company's Web site expands on the positive "Rethink Possible" slogan with a number of other phrases, including "Because before it could be done, it couldn't," and "Play the angel's advocate." "Our brand promise is to 'Rethink Possible,'" the Web sit reads. "But it's more than a slogan —it's the expression of what we stand for. It's what we strive to do every day so you can stay connected to the people and things that matter to you the most." Included are a list of services offered by AT&T across a variety of its businesses beyond wireless, including cable television, and the development of home-based medical monitoring devices like "life slippers," which help indicate a likely fall before it happens. The campaign is a change from the previous effort, in which AT&T, with the help of actor and spokesman Luke Wilson, directly took on criticism from rival carrier Verizon. The campaign also made note that AT&T's network allows users to take a call and surf the Web at the same time —something not possible on Verizon's CDMA network. AdAge said the change is a "definitive attempt" to get away from the advertising battle with Verizon, and focus on the positives of AT&T and the services it offers customers. The battle between Verizon and AT&T has been personal times, resulting in a lawsuit (that was later dropped) and featuring countless ads from both companies insulting the others' service and coverage. Verizon's own advertisements mocked Apple's "There's an app for that" slogan by showing a coverage map with Verizon service, stating "There's a map for that."